in "Argo" © 2012 Warner Bros.
Director/star Ben Affleck's "Argo" was overpraised with Oscar buzz after early screenings, which is unfortunate. This period piece about the American hostage crisis that began in 1979 Iran has its good points, including a few genuinely suspenseful moments. But anyone expecting an incisive cinematic masterwork instead of a fairly conventional phonied-up thriller will be in for a disappointment. Based on actual events but enhanced with a frustrating number of fictional flourishes, "Argo" relates how CIA agent Tony Mendez (Affleck) carries out an elaborate hoax to rescue Americans secretly holed up in the Canadian ambassador's residence in Tehran. Those six literally slipped out the back door of the US embassy when rioters took 52 of their coworkers hostage. "Exfiltration" expert Mendez, who specializes in seemingly impossible extrications of human assets from unfriendly areas, is a bearded and out-of-the-box thinker who naturally makes his desk-bound superiors look like out-of-touch dummies. He proposes that the CIA set up a bogus movie production company that will send him to Tehran in the guise of a Canadian scouting locations for a science-fiction film called "Argo." Mendez intends to supply the six hunkered-down Americans with Canadian passports and new identities as the phony film's director, cameraman, writer and other associates. Preposterous as the idea sounds, it beats alternatives such as smuggling bicycles to the six so they can pedal 300 miles to the Turkish border. Bryan Cranston plays Mendez's typically gruff but admiring boss, who helps sell the idea to the State Department. 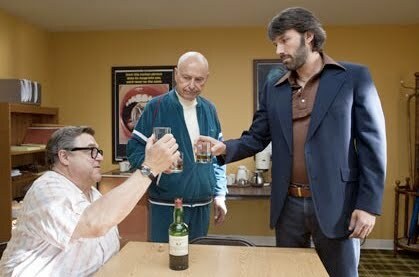 "Argo" has a lot of fun with two Hollywood types enlisted in the charade. John Goodman plays an easygoing makeup artist who has provided unspecified help to Mendez in the past. Alan Arkin is an entertainingly cantankerous producer who sardonically observes that "John Wayne's in the ground six months, and this is what happens to America." The main problem with the film is that first-time screenwriter Chris Terrio has added too many completely imaginary scenes under the guise of dramatic license, instead of sticking with facts that would have been sufficiently fascinating. The movie is full of ridiculous last-second saves and even a bullets-flying car chase that simply didn't happen. Also, Washington never put everyone's life at risk by pulling the plug on the mission at any point, and a ticking-clock kerfluffle over airline tickets that looks glaringly unlikely is, sure enough, completely bogus. The only way "Argo" could have gotten away with including such preposterous thriller cliches would have been if they actually happened. Instead, all of the major suspense beats here are tension-goosing fictions that undercut the entire story's credibility. Considering the way "Argo" plays fast and loose with the facts, becomes farcical for the Hollywood bits and portrays Iranian bad guys as cartoon-villain incompetents, the movie may have worked better as a wall-to-wall dark comedy. Instead, the inside-Tinseltown tongue-in-cheekiness is at odds with what "Argo" tries to pass off as behind-enemy-lines, "Not Without My Daughter"-style drama. A presumably unintended consequence of the movie's arrival now is that it plays like a one-dimensional propaganda piece that could be embraced by the currently agitated "bomb Iran" crowd. Nobody who sees "Argo" is likely to leave the theater feeling more positively about Persians, that's for sure. An awkward fact the movie raises is that Iranians had good reason to despise their former Shah, a high-living dictator propped up for decades by western nations and given medical treatment in the US after he fled Iran. There's no way to know if the hostages would have been released as promised in exchange for the Shah's return, instead of for the weapons Iran eventually received from the Reagan administration, but that option apparently never was on the table. That means "Argo" offers no thoughtful introspection or soul-searching about the ethics of the US government protecting a corrupt former ally at the cost of leaving Americans in captivity, some for 444 days. That kind of thing apparently is harder to get on film than yellow ribbons, chador-clad women eating Kentucky Fried Chicken or a car chase that never happened.